So I’ve been watching videos coming out of DDXP about the next iteration of D&D. I’ve seen activity on forums ranging from hysterical accolades to hate-filled diatribes. I’m curious if others out there are following the news. Sound out in the current Hunter’s Quarry poll. Poll of the Week. What’s a DM to do? I was recently involved in an online conversation. A player relatively new to 4E was asking a group of more experienced gamers, myself included, about a situation he encountered and how we would have adjudicated it. I gave my answer and was surprised at some of the answers that came back. I’d like to throw this out there and see what others think and why? The Psion made it clear his goal was to do damage to the enemy while trying to pull him, smashing him into the bars of the window, possibly doing more damage. 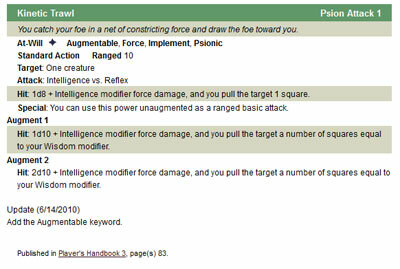 The Psion successfully scored a hit and normal damage was dealt for the attack. But how, as a DM would you rule on the forced movement? Please answer below and explain in the comments. This is a simple one. D&D 4E didn’t introduce roles to D&D but it certainly did a lot to hardcode them into the design. For better or for worse, the game has evolved because of it. Some love it, some don’t. Whether you’re a fan or not, you probably have a preference when it comes time to decide. When you think of your ideal character in combat, are you dealing out the damage to the enemies, supporting your compatriots with healing spells, unleashing spells to harry and dissuade your foes, or drawing enemy fire to take the heat off your party? Maybe you prefer some mix of these? Feel free to comment, both on WotCs decision to place greater emphasis on the mechanical role of each class as well as why you like or do not like certain roles in gameplay. I’ve decided that I would start a weekly poll. I want to ask a question that is on my mind and see what happens. Here is the first of the series.